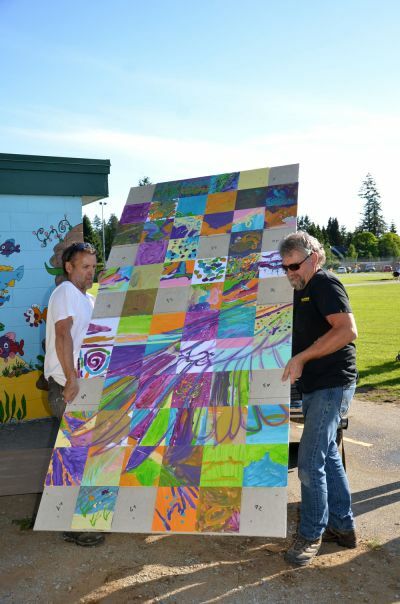 The idea for the mural came about as a way for the Pitt Meadows Public Art Steering Committee not only to educate local residents about public art but to engage children at the 2013 Pitt Meadows Day celebration, according to Sigmund. Gatorfoam was recommended as an ideal lightweight-yet-rigid substrate for the mural by Kevin Josephison, territory sales specialist for the Port Coquitlam, British Columbia, branch of EM Plastic & Electric Products Ltd., a Gatorfoam distributor. “We wanted a material that would be lightweight, that wouldn’t break down and that would be mold-, mildew- and moisture-resistant,” said Dinwoodie. Gatorfoam regularly is used to create interior signage and displays and can be digitally direct-printed. 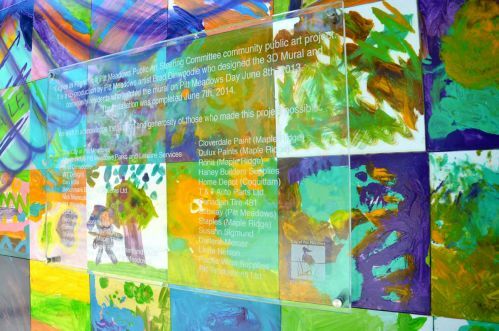 Dinwoodie’s original mural design was printed onto the four 4-by-8 sheets of Bright White Gatorfoam by Port Coquitlam-based Epic Imaging, Inc., which utilized a Fujifilm Acuity UV flatbed printer. The printed mural was cut into 288 8-by-8-inch tiles that were numbered on the reverse side for placement in the finished artwork. 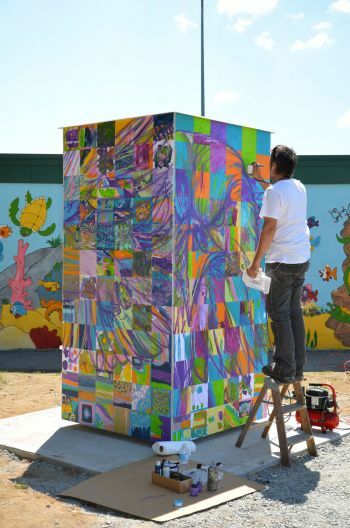 Local children, teens and adults gathered at the 2013 Pitt Meadow s Day were asked to paint the tiles with exterior acrylic house paints in bright colors. “We let them have a heyday … The kids got the concept but still didn’t understand that they should paint within the lines (of the printed mural design),” said Sigmund, explaining the need for Dinwoodie’s airbrushed overlay image. Finding a large interior wall within city-owned property to display the completed mural – which measured 8 feet tall by 16 feet wide – proved to be another challenge. So, Sigmund and Dinwoodie devised a plan to display the mural outdoors wrapped around a three-dimensional aluminum frame containing cement-board walls. The sculpture would feature a rain-guard top and be secured to a poured concrete base. The painted Gatorfoam tiles would be adhered to the cement board with LePage PL Premium construction adhesive. Any exposed edges or spaces between the tiles would be sealed with clear silicone. 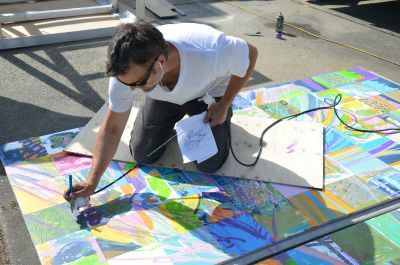 The entire mural would be sealed with four coats of a urethane-based UV clear acrylic in order to protect it from the elements, UV sunlight (fading) and graffiti. While Gatorfoam routinely is utilized for interior displays, 3A Composites USA has introduced Gatorfoam Exterior for outdoor applications. Available in 1-inch, 1.5-inch and 2-inch thicknesses in the Bright White color, Gatorfoam Exterior is manufactured with a top-grade adhesive that is designed to withstand exterior conditions. Any exposed foam edges of Gatorfoam Exterior must be protected from UV exposure with a high-quality, pigmented water-based coating or other UV barrier. 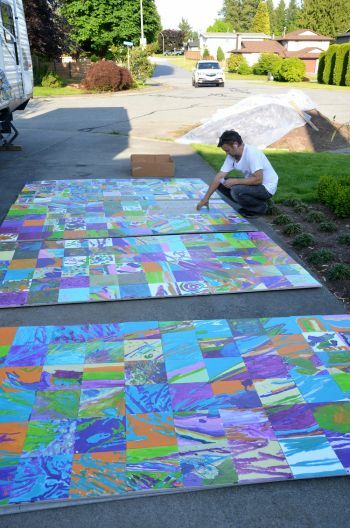 In order to gain project approval from the Pitt Meadows City Council, Dinwoodie contacted Gary Scott, senior technical field representative, 3A Composites USA, to review his plans for installing this mural outdoors. While most materials, design services and labor were donated by local businesses for the “Eagles in Flight” mural sculpture, the City of Pitt Meadows Public Art Steering Committee and City Council had to vote to absorb the expense of structural engineering services, the aluminum frame and installation. “For our little community (population 18,200), this was a really big deal,” said Sigmund.